My most recent find which can make this dream come true is what I would class as barefoot luxury. 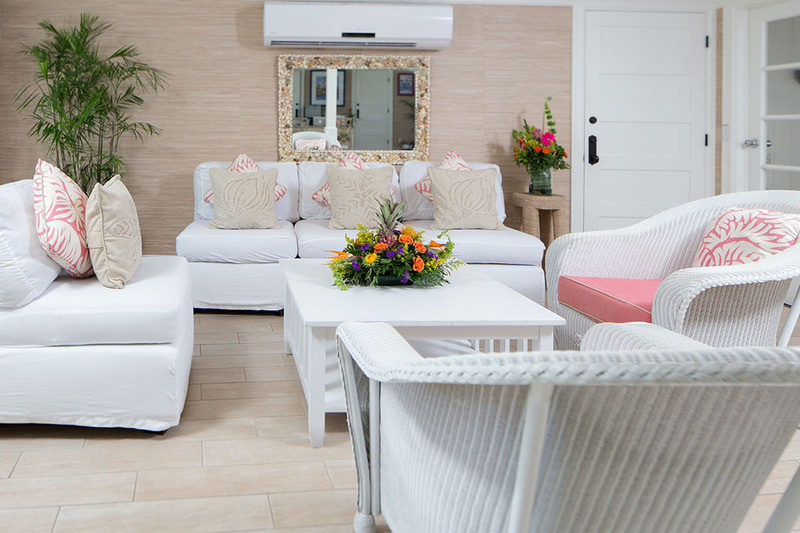 Hope Town Harbour Lodge is set amongst a very pretty little pastel coloured town which has everything you need. Boutique in size, the Lodge sits up on a ridge that overlooks the harbour on one side and the ocean on the other. 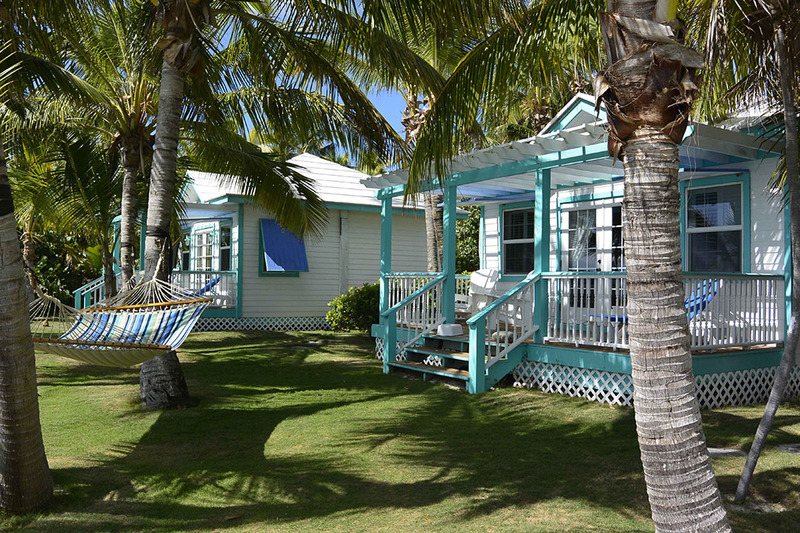 The cottages and main hotel are gorgeous and painted in fun Caribbean colours, mainly periwinkle turquoise and white. 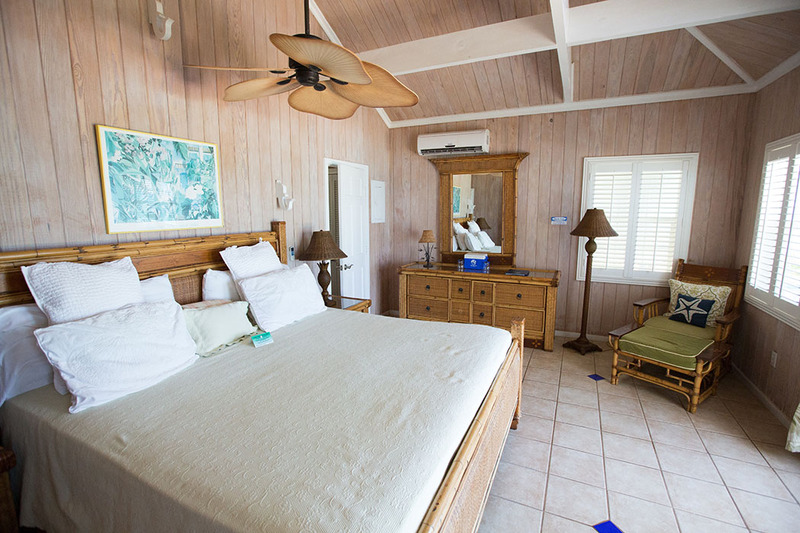 You can book Lodge rooms which have cheery bright decor, air conditioning, a harbour or ocean view and a king or queen bed. Then there are cabannas which are poolside and beachfront, and finally, cottages which enjoy a bathroom, kitchen and bedroom. 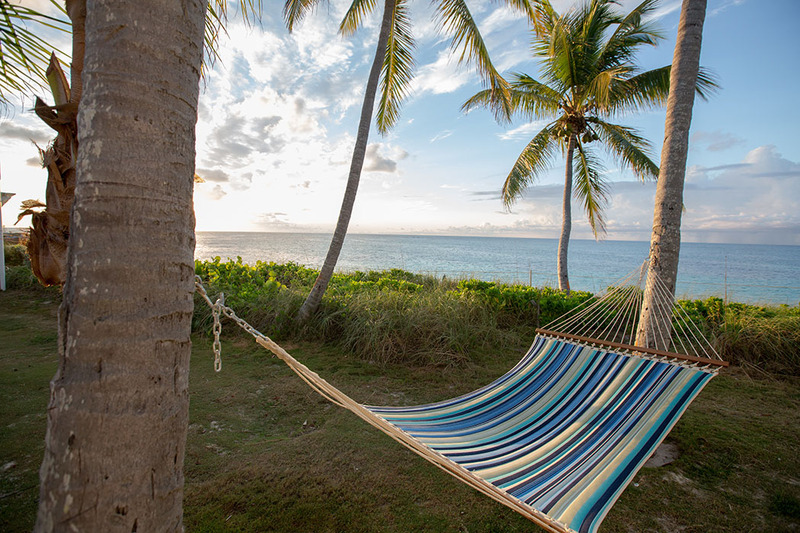 These cottages are roomy and comfortable offering king-size beds, large twin-sink bathrooms, and honeymoon-level privacy. The front porch is wonderful and spacious and perfect to enjoy the sun and sea breezes and maybe a tropical cocktail on your own private deck under the shade of palm trees, or in one of the hammocks that sway just off the steps. 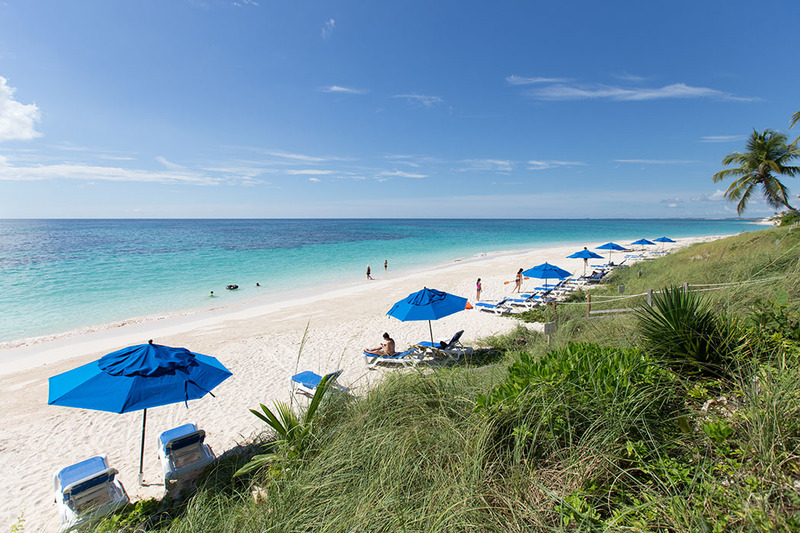 The beach is the best beach on Elbow Cay with white sand and crystal clear turquoise water. 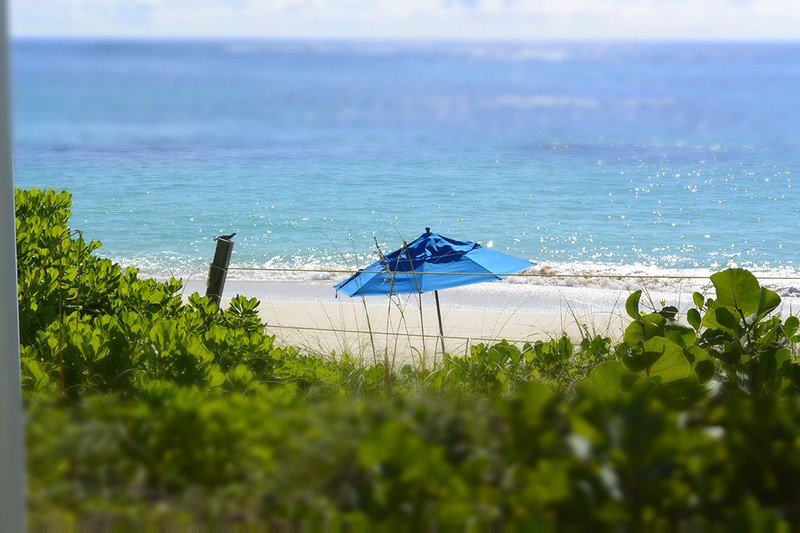 Plenty of chaise lounge chairs and beach umbrellas are set up so that you can enjoy the beach. It is completely unspoilt and is never crowded because there are no other hotels in the vicinity. 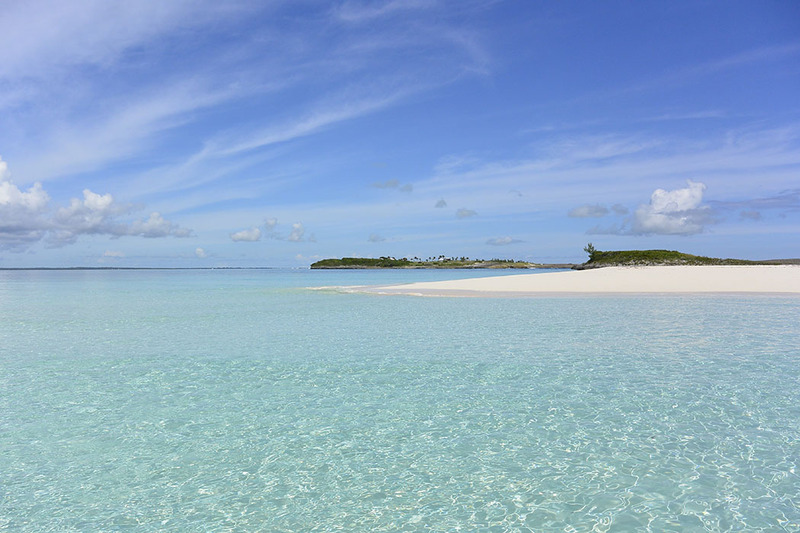 The water couldn’t be more clear with a 30-50 ft. visibility plus there is a reef 30 yards from shore which attracts hundreds of small fish and the occasional big ray or shark. There is a really nice pool next to the Reef Bar. 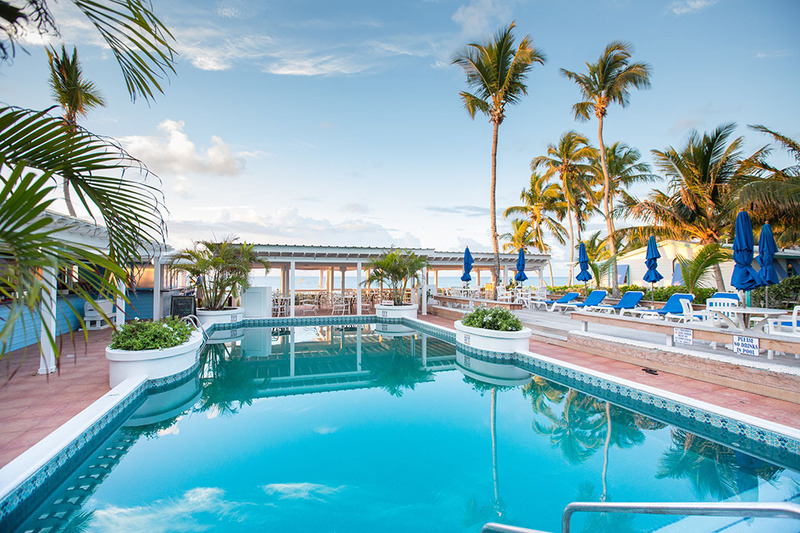 The pool area is well maintained and a relaxing place to kick back for hours at a time. 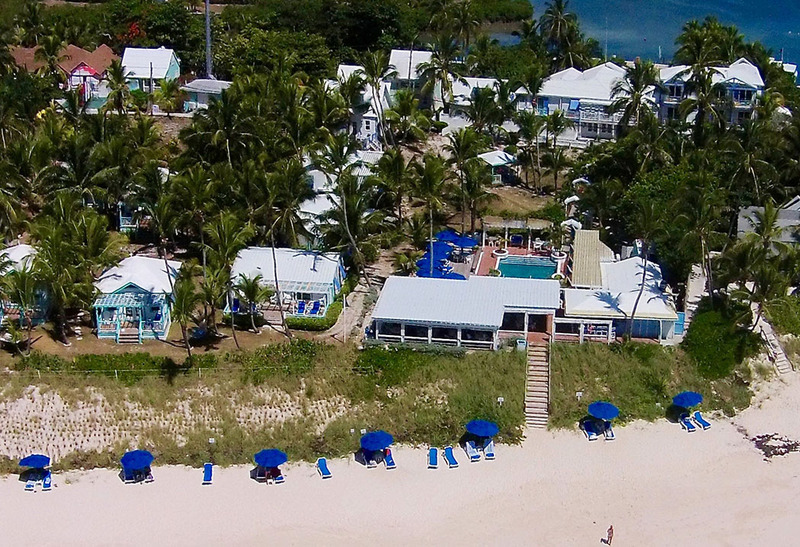 This boutique resort offers dining at the Reef Bar & Grill, just a few steps from the ocean with complimentary coffee and breakfast in the morning and delicious lunches. 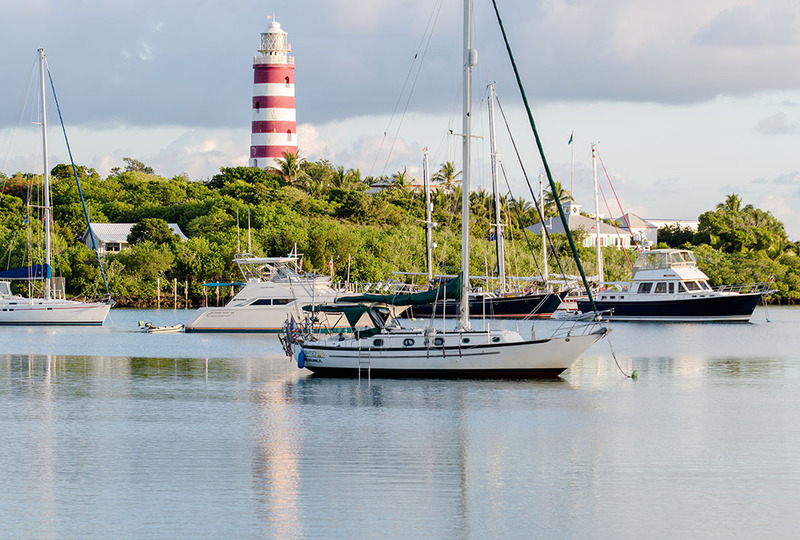 Hope Town’s most coveted dinner reservation has long been a table in the Lodge’s very own Great Harbour Room where the romantic atmosphere is enhanced by the inspiring view of the harbour’s twinkling lights and the superb wine list. You do not need to rent transportation here, everything in the pretty village is within walking distance and the breeze off the ocean makes exploring the island by foot very enjoyable. 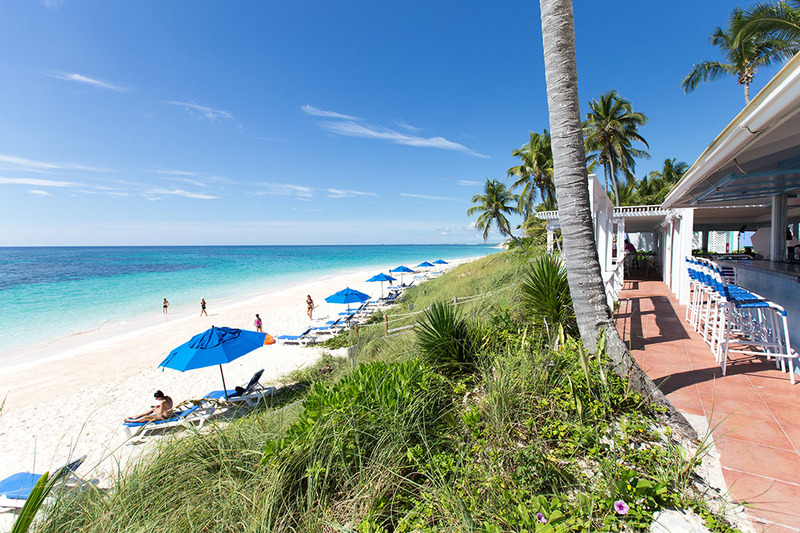 You can also golf, cart or rent a bicycle plus there is a plethora of sea based activities are available from the hotel and locally including snorkelling, diving, boat trips or relaxing on the beach. 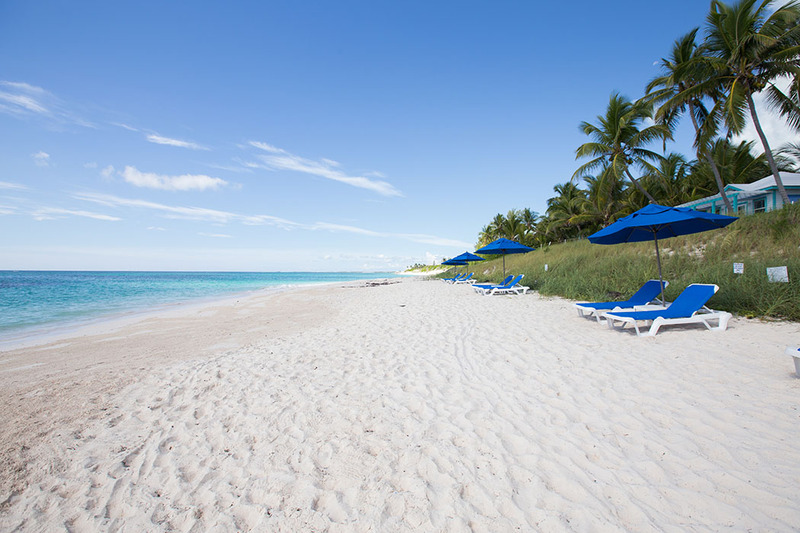 The close proximity of Florida makes travel to Hope Town easy. Since it’s a small island, you’ll ultimately arrive by boat. Fly direct into Marsh Harbour in around an hour from Fort Lauderdale, New Smyrna Beach, Miami, Nassau, West Palm Beach, Atlanta or Orlando International. Once you’re on the ground in Marsh Harbour, take any taxi to the Public Ferry Dock (they’re easy to find, friendly, and it’s about $20/person one way/ $30 round trip for the 20 minute ferry ride). 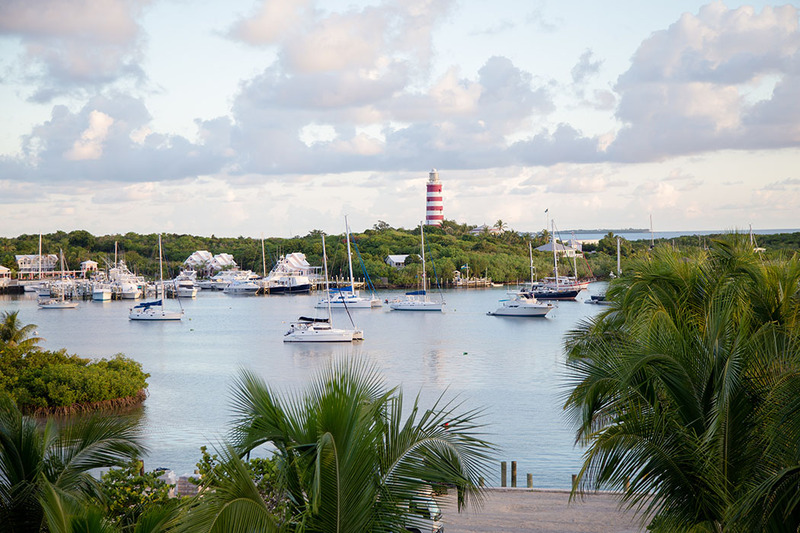 Tell the ferry captain you’re headed to the Hope Town Harbour Lodge. He’ll radio ahead and the wonderful staff will be waiting for you at our dock to welcome you and handle your luggage. 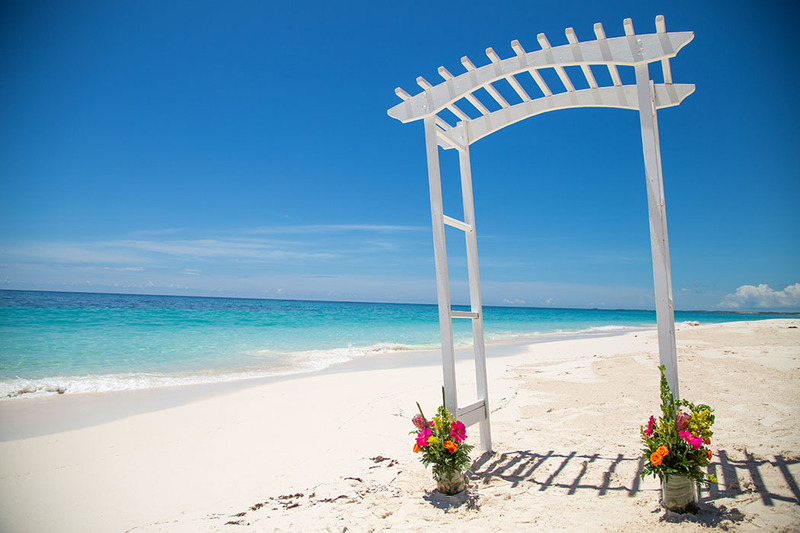 Wake up every morning to the beautiful blue water splashing against the sand just outside your door. Spend the day on the kind of beach that you drool over when you see pictures of long, deserted beaches with soft white sand. Go to sleep listening to the waves once again. Life doesn’t get much better!